Boston’s New England Aquarium is fortunate to be located on the harbor allowing for a true aquatic experience. Dockside, cruise boats offer historic sightseeing and sunset cruises, whale watching, ferries and shuttle service along the waterfront. 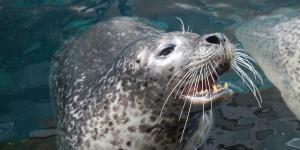 Upon your arrival, playful Atlantic Harbor Seals will greet you in their 42,000 gallon outdoor home where staff feed and train them daily. Just inside the Aquarium, more than 80 penguins are ready to entertain you as they hop, dive and fly through the water. 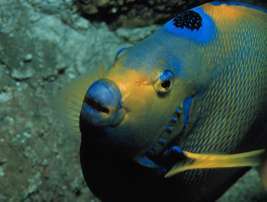 The Aquarium’s centerpiece is the four story, 200,000 gallon Giant Ocean Tank, home to more than 1000 Caribbean reef animals. The star resident is the green sea turtle, Myrtle, who has called the Aquarium home since 1970. 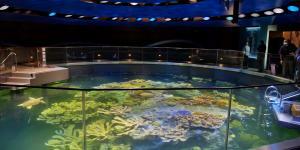 The Yawkey Coral Reef Center atop the Ocean Tank allows visitors stunning views of unique coral reef dwellers such as batfish, dwarf sea horses and eels. Other exhibits include the Shark and Ray Touch Tank which features sharks and rays in a tank surrounded by shallow edges and viewing windows, allowing visitors to experience a close encounter with these animals. 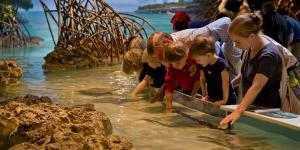 Another favorite is the Edge of the Sea's tidepool touch tank where visitors can pet a sea star, meet a blue and white lobster or cradle a hermit crab. Not to be missed are the Sea Dragons whose exceptional camouflaging abilities to avoid predators may even fool you. Another must is a visit to the Amazon Rainforest where piranhas, anacondas, electric eels and poison dart frogs await you. The California sea lions and Northern fur seals romp and play all day in their open-air residence. Piping plovers, sanderlings, terns and other New England shorebirds frolic in the Gulf of Maine exhibit while giant sea stars and crabs live among boulders and caves and cod, halibut and dogfish sharks swim over sand flats. Join the Aquarium's animal rescue team. A special sea turtle experience is waiting for you! 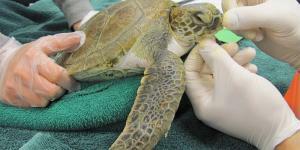 When you visit you will discover the Aquarium's thriving rescue program and become an honorary sea turtle rescuer. Come explore what it takes to save hundreds of these fascinating animals during the Aquarium's busy sea turtle rescue season. A new interactive exhibit gives you hands on experience with the process of diagnosing, treating, and rehabilitating some of the ocean's most vulnerable species. Plus, you'll learn how communities are coming together to protect turtle habitats and get a glimpse at some of the Aquarium's greatest turtle rescue success stories. There are daily presentations, behind-the-scenes tours, family programs and other special events year round. Check neaq.org for all the details. An equally amazing experience can be found at the IMAX Theatre adjacent to the Aquarium. For a sensory overload catch a 3D film on a screen six stories high and wrap around 12,000 watt digital sound -going to the movies will never be the same.